Life on earth is a journey toward eternity. And how we live is paramount to our destiny. The pivotal moment of our journey began with a choice to receive Jesus Christ as our Lord and Savior, making our hearts His home. At that moment, the Holy Spirit took the reins and changed our course. As we walk through life being led by God and transformed by the Spirit, we experience a series of movements by the power of the Holy Spirit. 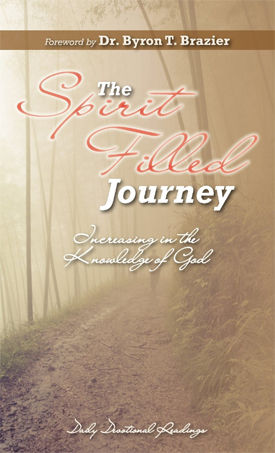 The Spirit-Filled Journey: Increasing in the Knowledge of God is a companion for your journey that will help you... •Gain a greater revelation of who God is •Grow in wisdom and understanding •Follow the Holy Spirit as He guides you Written by ministers and members of the Apostolic Church of God, The Spirit-Filled Journey: Increasing in the Knowledge of God is the second in a devotional series designed to strengthen your walk with the Lord and deepen your faith in Him.